2. Second, it redefines the period of the centennial celebration. Previously, centennial planning followed the logical and customary schedule of a series of preliminary events culminating in a centennial celebration on the states100th birthday in February 2012. Now, the celebration is redefined as a series of events extending through 2012. This is an obvious ploy to disguise the fact that the centennial museum, the “centerpiece” of the celebration, can never be open by the centennial. Exactly what supports the assumption that the centennial museum (AKA Arizona Experience Museum) will open in 2012, or that it will ever open? Two years of fund raising produced less than 10% of the required $15.75 million. If the centennial museum is going to be built, where is the money coming from? Are state funds now being diverted to the centennial museum? In her February 2010 presentations and press release, the Governor promised that “no public funds” would be used for Arizona’s “birthday gift”. Is she breaking that promise? Ted Rushton, now retired, is a former reporter, photographer, columnist and editor for newspapers and magazines in Canada, New Mexico and Arizona. It's hard to keep a bad idea secret, as everyone from dumb politicians to even dumber television stars know. Word of a bad idea spreads like wildfire and burns everyone involved. The proposal to create a $15.5 million 'Arizona Experience Museum' near the state capitol is an egregiously bad idea. The proposal has been talked about for the past year, with only $1.75 million pledged as yet. Why? Simply because this bad idea requires closing the Arizona Mining and Mineral Museum, one of the finest such institutions in the United States. Few people, businesses or foundations want their reputation linked to destruction of one of America's foremost institutions. Instead of learning about the geology and mines of Arizona, thousands of schoolchildren who now visit the Mining and Mineral Museum will learn, "This is where one of America's finest museums used to be located. "It was scrapped to make a glitzy showcase to show tourists some famous facts about Arizona. How many of you students are tourists? How many want to see a picture of a famous Arizona cow?" It's not that showcasing Arizona cows, cotton, citrus, climate and copper is a bad idea. Done properly, tourists will be delighted to see pictures of famous Arizona cows. Likewise, little “bales" of cotton, the size of a small matchbox, are always a popular tourist draw. And what could be finer than a picture of a glass of orange juice -- sorry, no glasses of real juice unless a snack bar is included. How does one make a memorable display of cotton? One idea is to use cotton candy flavored with cactus juice. Climate? Well, perhaps one room can be kept at 22 degrees, marking the coldest it’s ever been in Phoenix. Another will be at 122 degrees, the hottest ever recorded. A big picture will show big airplanes waiting in big lines at Sky Harbor, because flight manuals only went to 120 degrees. Cactus? None planned. Apparently, it's not "Arizona" enough. Think of "naming rights," similar to Chase Bank and "Chase Field" of the Arizona Diamondbacks. Perhaps donors can be recruited to sponsor one each of the "Five C's" in the Arizona Centennial Museum(ACM). For example, Titan Corp. may sponsor the 'C' as in "C Our Cotton Grow ‘display. MegaCorp Industries might be proud to "sponsor" a picture of Arizona’s most famous cow -- "an animal that produced 4,444 quarter-pounders for Mickey D!" -- in the ACM (Awesome Cow Museum). Think of an "Arizona Centennial Song" to celebrate the new museum, which is not expected to open until the Centennial year ends. In1943, the musical 'Oklahoma' -- the film version used Arizona locations -- had a memorable song, “Every thing’s Up to Date in Kansas City ...." Maybe this could be adapted to Arizona, "Every thing's behind the times in Arizona, They're just about as slow as they can be ..."
Think of a historic plaque outside the new museum, telling tourists, “This is the site of what used to be one of America's finest museums. It was scrapped to make way for this museum of cows, cotton, citrus, climate and copper." Note: The plans for the 5C Arizona Centennial Museum (AKA Arizona Experience) have been recently supplemented to make it more interesting. Current plans add stories, smells, and vibrations. There will also be displays that ‘imagine the future”. The awesome cow will have serious competition. When the centennial museum was announced in early 2010, the justification offered was that it would be able to support the rent for the building and the mineral museum could not. The first post on this blog showed the story was a hoax because the rent budget was simply transferred from the mineral museum to the AHS. Now, further investigation of the bizarre rent policies for State owned buildings has revealed the ultimate outrage. A portion of the excessive rent charged for the state owned mineral museum building was actually subsidizing the Arizona Historical Society. State agencies occupying state owned or state leased buildings pay rent to the Department of Administration. The money is deposited into the Capital Outlay Stabilization Fund (COSF), which pays for utilities, maintenance, grounds services, operating supplies, and janitorial services. However, there is a dirty little secret. Most agencies have been exempted from rent payments by statute. Their buildings are still serviced and maintained by the COSF. Of the 4 million gross square feet (GSF) of floor space owned and leased by the state, rent is collected on only 1.3 million GSF. That explains the ridiculous $524,700 rent for the mineral museum. It should have been only $170, 500. The annual lease purchase payment for the ARIZONA HISTORICAL SOCIETY’S Marley Center Museum in Papago Park (Tempe). The AHS political connections and lobbyist provide it with so much preferential treatment that the true cost to taxpayers is virtually impossible to determine. Has the Arizona Historical Society abandoned its mission? 1. Books, maps, papers and materials pertaining to the history of Arizona and the west. 2. Narratives of historical events of the exploration and early settlement of Arizona, and of overland travel in the state and the west. 3. Data relating to Indian tribes, and portraying the antiquities, the past and present conditions and progress of the state. 4. Historical and scientific reports of the western states, and materials and facilities for investigation of historical, scientific, social, educational and literary subjects. 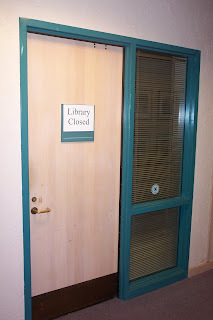 The photo shows the professionally lettered closed sign on the library door at the Marley Center Museum (AKA History Museum at Papago Park). The Marley is not being operated in accordance with the italicized portion of the statute. Rather, it solicits special events such as weddings to supplement its budget. Indeed, the Marley appears to have been specifically designed for that purpose. The architectural plan actually showcases the cocktail bar and party areas rather than the museum. If the AHS was self-supporting, that might be appropriate. However, it is not. It is renting out publicly owned buildings to merely supplement its budget and that practice results in a large net loss for taxpayers. In FY 2011, the AHS got a $6,285,000 appropriation from the State of Arizona (84% of its total budget). Why was such a misguided and inefficient state agency now permitted to begin yet another museum project on the Capitol Mall in the midst of a financial crisis? Why was the new museum authorized when the plans clearly show it is in no way related to the mission of the AHS as defined by Arizona statutes? Note: The photo was taken on Feb 6, 2011. On Apr 18th the same apparently permanent sign was still on the locked door. The AHS has seven types of memberships with dues ranging from $25 to $1.000. They currently have 8 student members, 976 individual members, 438 household members, 218 sustaining members, 49 patron members, 18 sponsor members, and 11 directors circle members. Therefore, they have just 1718 paid memberships representing something over a couple of thousand individuals. Dues paid for these memberships are $131,500, just 2.5 % of the AHS budget. Although the AHS has little community support, it does have political connections and a lobbyist. Therefore, it has a $5 million dollar budget. Eighty percent of it comes from the state general fund (taxpayer’s pockets). Most of the rest of the AHS budget comes from renting out state owned building for events such as weddings. The direct FY 2012 taxpayer subsidy of $4,151,100 represents a subsidy of $2,416 per membership. Even though the AHS lacks community support and attracts few visitors to its museums, it was assigned yet another museum in the midst of the financial crisis. The top rated Arizona Mining and Mineral Museum was transferred to the AHS. The AHS has closed the mineral museum and terminated its K-12 education programs. They plan to use the building for a centennial museum (AKA Arizona Experience) even though they have thus far failed to raise the funds to build the new displays. The AHS demonstrated similar failures at Marley Center Museum in Tempe and Rio Nuevo in Tucson. Success and community support is not necessary to maintain a government agency’s budget. Is the Arizona Historical Society misappropriating funds? The budget includes $589,700 and 1 FTE Position from the General Fund in FY 2012 for the Centennial Museum. These amounts are unchanged from FY 2011. This line item funds the operation and maintenance of the Arizona Mining and Mineral Museum as part of the Centennial Museum. That statement is consistent with ARS 41-827 (see May 10th post) which states that the centennial museum shall house the mining and mineral museum. However, the AHS is completely dismantling the mineral museum and disposing of its assets. According to their latest floor plan for the centennial museum (AKA Arizona Experience), nothing but a small 500 square foot mineral display will remain.